The first Ukraine stamps for postal use were issued in July 1918. These new postage stamps utilized the same pictorial designs used for the emergency monetary tokens issued in April 1918. The monetary tokens were printed on perforated cardboard with inscriptions printed on their back sides, and they were not valid for postage. The former Russian imperial territory of Ukraine established the Ukrainian National Republic or Ukrainian Peoples' Republic during June 1917, following the February Revolution in Russia that year. In the time period leading up to and following the Bolshevik Revolution of October 1917 and the collapse of the Russian monarchy, the Russian Civil War began (1917-1922). During this period, there were actually multiple governments vying for control within Ukraine, triggering a Ukrainian Civil War (1917-1921), within the scope of the ongoing Russian Civil War. In March 1921, the Polish-backed Ukrainian National Republic collapsed and the government permanently fled the country. The Bolshevik-backed Ukrainian Soviet Socialist Republic, which had been established in March 1919, would eventually emerge as the legitimate government of Ukraine. On December 30, 1922, the Ukrainian Soviet Socialist Republic became one of the four founding members of the new Union of Soviet Socialist Republics (USSR), beginning the eventual incorporation of the major territories of the former Russian Empire. The Ukrainian SSR would eventually become one of the dominant member-states of the USSR, and in fact, two future leaders of the USSR, Nikita Khrushchev and Leonid Brezhnev, were both Ukrainians. 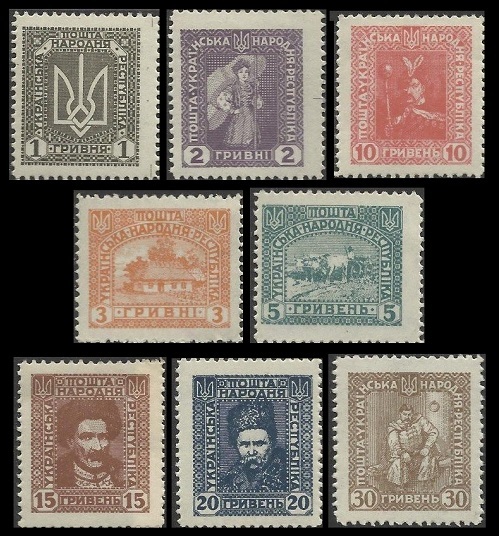 The five pictorial Ukraine stamps shown above were issued by the Ukrainian National Republic during July 1918. These stamps are known as the Shahiv Issue. They are typographed on thin paper and they are imperforate. 10 Sh. - Trident symbol of the Ukrainian republic. The symbol is actually from the Coat of Arms of Vladimir the Great (Lived: 958-1015, Ruled: 980-1015), the Grand Prince of Kiev and the ruler of Kievan Rus (Russia). 30 Sh. - Allegory of Ukraine. 40 Sh. - Trident symbol of the Ukrainian republic. 50 Sh. - Denomination numeral. 10 Sh. (1918 - Sc. #1) - Buff. 20 Sh. (1918 - Sc. #2) - Brown. 30 Sh. (1918 - Sc. #3) - Ultramarine, Blue. 40 Sh. (1918 - Sc. #4) - Green. 50 Sh. (1918 - Sc. #5) - Red. Forgeries of these stamps are printed on very thin, glossy paper. In August 1920, the Ukrainian National Republic decided to issue a new set of pictorial postage stamps, exemplifying the character of Ukraine and its people. These fourteen Ukraine stamps were designed by Mykola Ivasiuk (1865-1937), a prominent Ukrainian painter of the time. 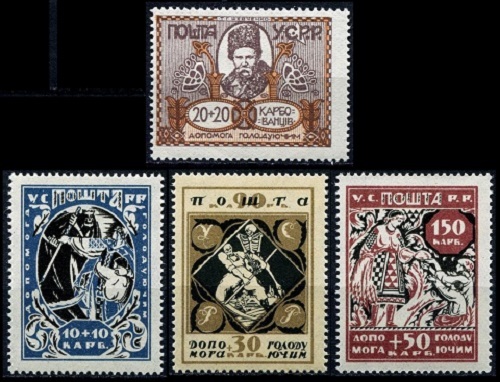 The stamps were printed by the Military Geographic Institute in Vienna, and they were delivered to the Ukrainian government in late 1920. They are referred to by philatelists as the Vienna Issue. Unfortunately, the collapse of the Ukrainian National Republic was imminent by the end of 1920, and these new stamps were NEVER ISSUED. These stamps, though they were never officially issued, are considered the most impressive Ukraine stamps ever created. 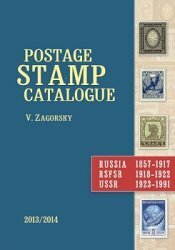 As a result, they are still avidly sought-after by stamp collectors around the World. Mint sets can still be found online for under US $10.00. 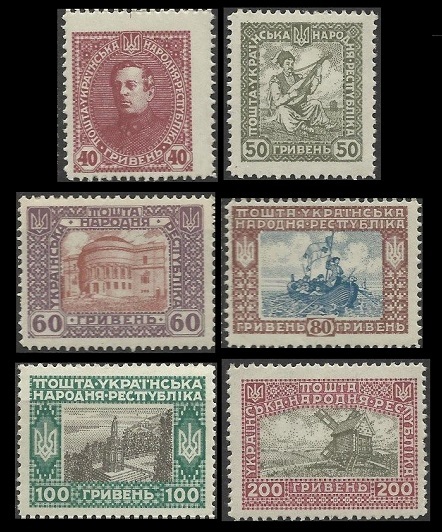 The fourteen un-issued pictorial Ukraine stamps shown above were produced in late 1920. They are lithographed and perforated 14. 001 Hrv. - Trident symbol of the Ukrainian republic. 002 Hrv. - Allegorical figure of Ukraine, carrying a Ukrainian flag. 003 Hrv. - Ukrainian peasant cottage, with a garden. 005 Hrv. - Salt Trader, with a yoke of oxen. 010 Hrv. - Bodhan Khmelnytsky (1593-1657), a leader of the Zaporozhian Cossacks. 015 Hrv. - Ivan Mazepa (1639-1709), a leader of the Zaporozhian Cossacks. 020 Hrv. - Taras Shevchenko (1814-1861), a Ukrainian poet, writer, playwright, and artist. He was an outspoken critic of social and national oppression. 030 Hrv. - Pavlo Polubotok (1660-1724), a leader of the Zaporozhian Cossacks. Having been arrested by Tsar Peter I in 1723, he is shown in chains in the St. Petersburg fortress where he died. 040 Hrv. - Symon Petliura (1879-1926), the leader of the Ukrainian National Republic, at the time that these stamps were produced. 050 Hrv. - A Cossack playing a bandura, the Ukrainian national instrument. 060 Hrv. - Parliament Building in Kiev. 080 Hrv. - Zaporozhian Cossacks in a boat on the Black Sea. 100 Hrv. - Monument to (Saint) Vladimir the Great (Lived: 958-1015, Ruled: 980-1015) overlooking the Dnieper River in Kiev. 200 Hrv. - Rural scene with fields of grain and a windmill. 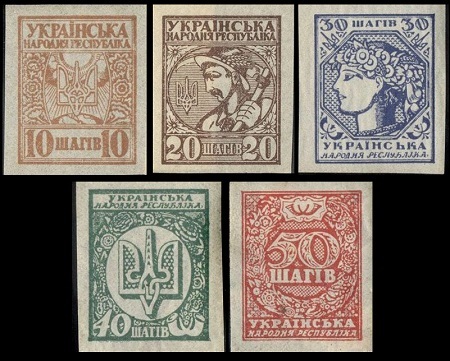 The four surtaxed pictorial Ukraine stamps shown above were issued by the Ukrainian SSR during June 1923 for Ukrainian Famine Relief. The stamps are lithographed, perforated, and they exist both unwatermarked (Sc. #B1-4) and watermarked crosses and circles (Sc. #B5-8). 010 K. + 10 K. - Allegory of "Famine". 020 K. + 20 K. - Taras Shevchenko (1814-1861), a Ukrainian poet, who was an outspoken critic of social and national oppression. 030 K. + 30 K. - Allegory of "Death stalking a peasant". 150 K. + 50 K. - Allegory of "Ukraine distributing food". 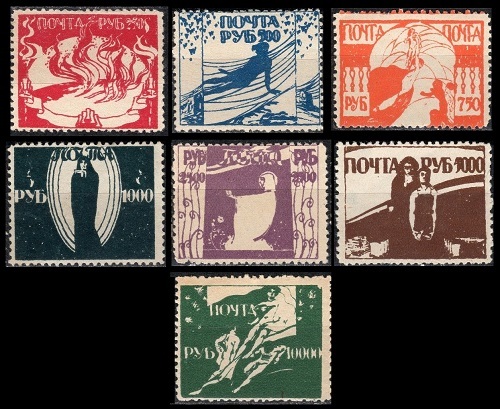 The seven Ukrainian stamps shown above, the so-called "Odessa Famine Relief Issue", are not actually postage stamps at all, and they were never used within the Ukrainian SSR or the USSR. They exist both perforated and imperforate. These were FANTASY STAMPS (CONTEMPORARY FORGERIES) produced by an Italian stamp dealer, with the intent to defraud stamp collectors. There is no evidence that the proceeds from the sale of these stamps were ever actually used for Ukrainian famine relief. They occasionally show up on the internet, usually in miscellaneous Cinderella stamp lots, and today, they are worth only a few cents each. Oddly enough, considering that they are practically worthless, there are forgeries of these fantasy stamps! The forgeries usually have smudgy colors and incomplete perforations.